Some of you may remember a couple of countdown videos I’ve posted over the years that a friend and I have put together. 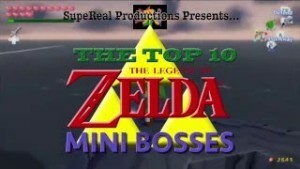 It started as a one off project but has ended up becoming a yearly tradition and we’ve recently done our fourth countdown: the Top 10 Mini Bosses from across the Zelda series. We have a side plot incorporated into the videos now that mainly started in the previous video, so if you haven’t seen that the intro on this one won’t make a lot of sense. You can check out that video which counts down our Top 10 Mini Dungeons by clicking here. Take the jump to see what we listed as our favourite mini bosses. While we’ve played most of the games in the Zelda series we haven’t been able to play them all so there may well be great mini bosses that haven’t been included. That being said, what did you think of our choices? Did we leave out any mini bosses you think should have at least gotten a mention? Let us know in the comments below.